Everyone Using Internet Now. Internet World Is Very Big And Fast. People`s Use Net To Get Your Life Goal. If You Think Your Glance Is Always On Your Goal And Your Goal Is To Get Success On Internet World , Then You Must Face Many Things To Do Your Work Perfectly. You Can Do This Work Easily. On Internet You Can Use Many Software`s For Success. But You Can Not Download Or Install Every Software`s Easily. 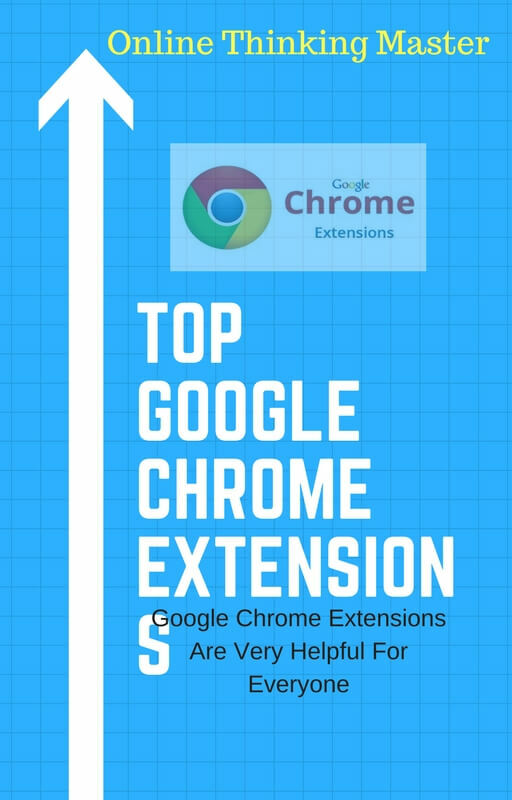 If You Are Using Chrome Google Browser For Searching , Then You Can Do Your All Work Perfectly And Easily. You Think How ? Because Google Chrome Give You Many Extension Of All Type Of Work. You Know What Is Extension ? Extension Is Small Software Which You Can Install In Your Browser And Can Use By Only One Click. If You Open Chrome Web Store You Will Find a Large Number Of Free Extensions Which You Can Use For Different Purpose. If You Are Online Marketer You Can Find Many Extension Related Analysis , SEO or As You Wish. So Come Here Are Some Best Extensions For You. * Top Benefits Of Using Facebook Business Page. * Top 6 Ways To Make Money Online From Home. * Top 5 Ways To Getting Huge Real Traffic To Your Website. * 4 Things Which Make Your Blog Profitable. * Top 5 Free Website SEO Analysis Tools For You. This Is a Also Best Extension In Google Chrome Web Store. The Keywords Everywhere Extension Is a Free Keyword Research Tool That Shows You Useful Google Keyword Search Volume and Cost Per Click Data on Multiple Websites. This Tool Saves You the Hassle of Copying Data From Various Websites and Using the Google Adwords Keyword Planner to See Relevant Search Volume and Cpc Data. Every Thing On One Click. …………….Get This Extension Here. This Is a Youtube Based Extension. Discover What Makes a Video Go Viral and Optimize Your Videos to Get More Views.With Metrics That Go Beyond Youtube Analytics, Vidiq Vision Delivers a Comprehensive Optimization Report Card for Any Youtube Video – Right on Your Browser. You Will Also See What Makes Related Videos Related?….How Do Videos Get Ranked in Search? Where Do Recommended Videos Come From?…..What Does Good Youtube Seo Look Like? How Does Social Media Fit Into Audience Development?.Or Every Thing Which You Want To Rank Your Youtube Fist On Youtube.Best For Best………..Get This Extension Here. Why I Like This Extension Because When I Open My Google Chrome My Starting Page Is Awesome , And I Feel Best Every One Like This. Live Start Page Is Easy-to-use browser Add-on That Will Significantly Enhance Your Work Experience on the Computer.